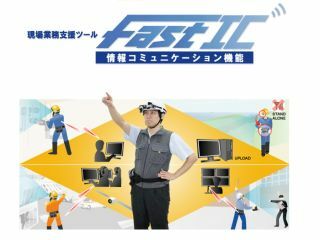 From 18 May Japanese construction workers could be carrying more electronics than an Akihabara nerd after a hot day's shopping, when Fujitsu Japan introduces its Fast IC remote-monitoring system. The essence of the system is that it uses Wi-Fi and dedicated Fujitsu equipment to provide a network between isolated staff on-site and monitoring personnel in a central command post. The 'IC' stands for 'Information Communication,' rather than anything to do with RFID technology. Hardware available from Fujitsu to interested parties ranges from specialised Windows XP laptops and digital cameras to construction-site helmets with video cameras and bone-conduction headsets. Pricing starts at ¥367,500 (£1,540) for a basic setup. Remote operational support (think of a Bauer-led team on 24 being guided into an empty warehouse for the umpteenth time by CTU). Relaying information about accidents to base. Gathering evidence on routine maintenance or investigations. Supporting a patrol guard or other security worker. Although much of the information supplied by Fujitsu is slightly vague at the minute, the system does sound like something that will develop over time, as it proves useful.